Fall is here at last. With its cooler temperatures, colorful leaves and spooky and festive atmosphere, Fall is a great time of year. 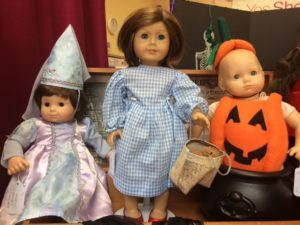 Halloween is coming up fast, so if you love all things spooky, you’re in luck! With all the scary movies coming out and fun decorations, the spooky lover must be so happy. Even people at work are getting into the Halloween spirit. 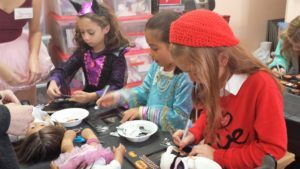 I started to discuss this very blog with my co-workers and that bloomed into a discussion of Halloween in the store. 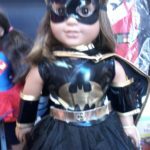 Favorite costumes from years past, favorite candy and must watch movies were loudly debated. Princess Leia vs Funky Monkey or Three Musketeers vs Snickers or Twitches vs A Charlie Brown Halloween. And of course is Nightmare Before Christmas a Halloween movie or a Christmas movie? 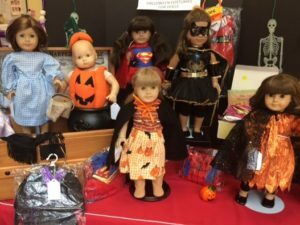 Of course, if you are in the Halloween spirit yourself and you want your doll to enjoy it too, you can visit Girl AGain to dress your doll in all sorts of costumes, from Belle to Spider-girl to Dorothy (and even little dog Toto, too!). 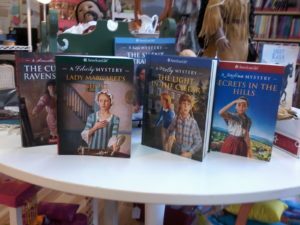 Or if you like to celebrate Halloween with a night in, we have a nice selection of historical mysteries to choose from! We will also be handing out surprise goodies during the day so come for a visit on 10/27/18! 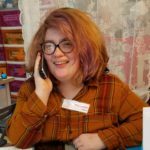 I am a Yes She Can trainee at Girl AGain, I wrote and published this using WordPress.